Our Hospice at Home team is a dedicated unit of healthcare professionals who visit patients in the comfort of their own home to offer palliative care at the end of life. Offering symptom management as well as support and advice, the team are there to help both the patient and their family. Working in partnership, the Hospice at Home team work around the clock, 24 hours a day, 7 days a week offering first class palliative care and giving that extra comfort and support to patients and families when they need it most. 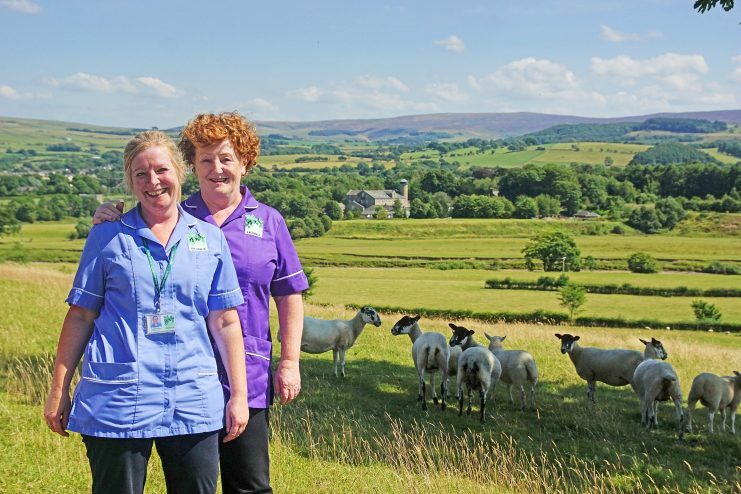 The Hospice at Home team travel as far as Garstang in the south, Sedbergh in the east and Ambleside in the north meaning that their expert skills reach into all corners of our community, every single day of the year. The Hospice at Home Team aims to bring the hospice to your home in the community allowing you to have a choice of where you wish to be cared for. Holistic nursing care and support for patients, families & carers. Support to the Primary Health Care Team to avoid a crisis admission to the hospice or hospital, where possible. ge from hospital for patients who wish to be cared for at home. Respite for carers for short periods, when required. Care will be offered for a specified period of one to four weeks, and 7 day care maintained. Some support at night can be given in the form of telephone calls or visits. The ongoing support will be reviewed as necessary to ascertain the needs of patients and/or relatives & carers. Our Hospice at Home nurses are caring for people in their homes in every corner of our community, 365 days a year.